This entry was posted in Bank Negara Malaysia, Investment Account, Islamic Banking, Mudharabah, Musyaraka, Qardh, Tawarruq, Wakala Fi Istihmar and tagged Application of Funds, Crowdfunding, Fund Manager, IFSA 2013, Investment Account, Islamic Banking, Role of Banks, Source of Funds by Amir Alfatakh. Bookmark the permalink. Many thanks brother for the wonderful write-up. I appreciate the insights from a practitioner. My comments as an aspiring academic (and former practitioner) are as follows: I understand your arguments but I believe the issue is that Islamic banking cannot seem to exist in the commercial banking mode. That’s why we keep hearing the ‘squeezing a square peg in a round hole’ comment. For two years I studied how we tried to fit Islamic banking into the commercial mode and my conclusion is it’s a joke. The issue with IFSA and Islamic banking globally I believe is that profit and loss sharing contracts such as musharakah and mudarabah, which arguably are the essence of Islamic finance, cannot be credibly practiced in a profit-maximising environment dominated by commercial, interest-based banks and customers who are not properly schooled on the values and merits of Islamic finance. So implementing IFSA without proper education of the customers, bankers AND central bankers seem to have pushed us into the exact position you narrated in paragraph three. My gut feel (it needs more research) is that the virtues of Islamic finance are better lived through other banking modes such as cooperative banks or savings banks. Sans the riba element, these institutions in Germany are inspiring. Of course they are not faultless but my initial belief (again, pending an in-depth research) is that they may offer vital lessons on how to put the ideals of Islamic finance into practice. 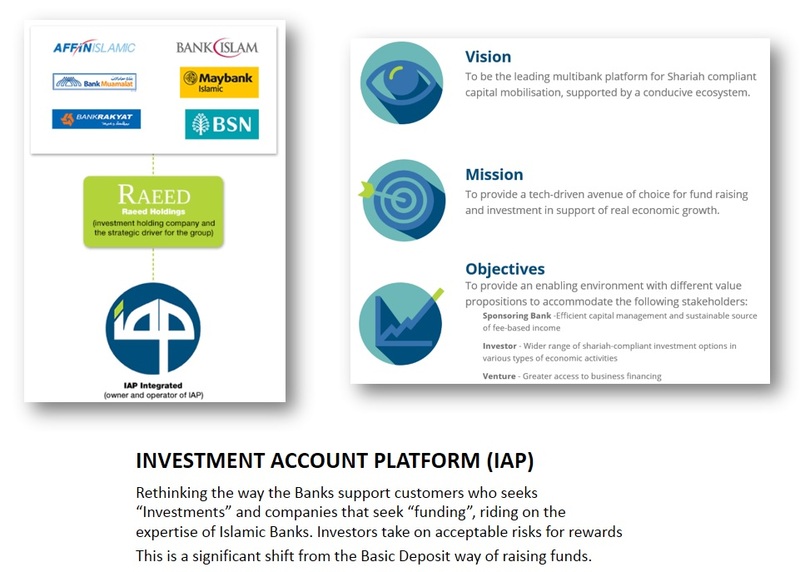 Right now, I am happy to be proven wrong but I fail to see how IFSA’s investment account AND the IA platform can succeed because the problem is that they are thrusted into a commercial banking model. For IAP, the ‘crowdfunding’ is done based on a bank’s criteria of ‘feasibility’ and ‘profitability’. The rating process and the inevitable need to manage customers’ expectations will I think, bring us back to square one. My two sens worth. Happy to consider other views. And I totally agree with you. Conventional banks, and by default Islamic banks modeled from a conventional bank, will find it hard to undertake the risks in a Mudharabah ot Musyarakah structure. The whole set up is geared for conventional banking dealing with conventional structures of risk and reward. BNM are putting up regulations that allow for a total rethink on how risks should be looked at. Not many folk will understand such intention. Liabilities = Investment Account , done! Asset = Equity Financing, 2017-18? – Will IFIs in Malaysia move towards Equity Financing Products (Values-Based Intermediation) ? Sweetener like IA cost saving on srr, etc? incentives or regulatory arbitrage? Yes, some research needed for this. Lots to write, so little time. Excellent! !you’ve contributed a wonderful piece of write-up on current issues in IF…..Very helpful and clear.